Art and Science of Delegation #Infographic ~ Visualistan '+g+"
Desperate times call for desperate measures, and starting a small business from the ground up is no stranger to desperate measures. Being an entrepreneur means making sacrifices in the now for big results in the future. This can mean skipping a paycheck once in a while, acting as one’s own accountant, office manager, and even receptionist. In the fledgling years of a company’s lifespan, multitasking in this way may be unavoidable and unfortunately can develop into bad habits that may come to block further success down the road. For smart managers, delegation skills stands out as one of the most important aspects of being a successful leader. Understanding their team members’ skills, limitations, strengths, and even personality all go into responsible delegation and when done correctly can result in explosive growth. Clearly defined expectations, open communication channels, and gratitude for a job well done promotes professional synergy as well as interpersonal synergy. 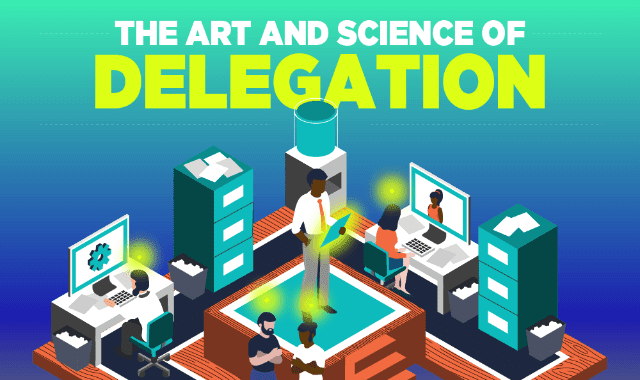 Take a look at this infographic from Scale Time for more on the art and science of delegation and how daily success leads to long term success.